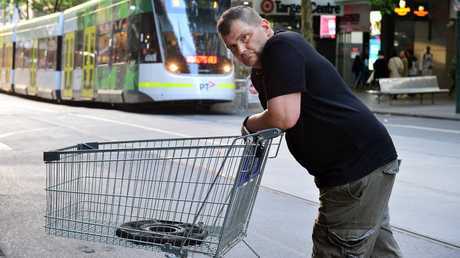 Michael Rogers, dubbed ‘Trolley Man’ after his heroic actions in the Bourke St terror attack, is wanted by police. 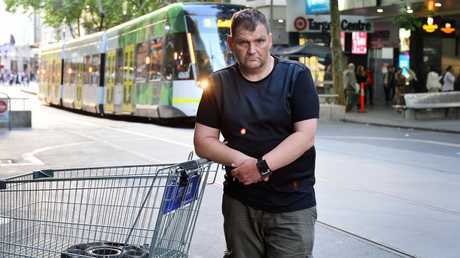 A homeless hero who was affectionately dubbed 'Trolley Man' in the wake of last week's Bourke St terrorist attack is now wanted by police, it has been revealed. Victoria Police are searching for Michael Rogers, 46, in relation to a number of alleged burglaries in the Melbourne CBD and St Kilda areas. 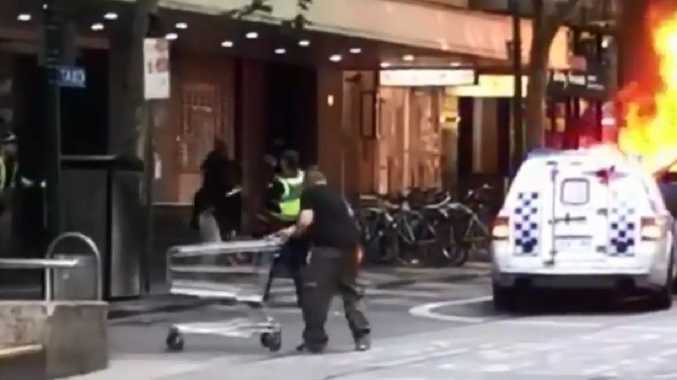 The homeless man attracted international media attention after he was captured on video shoving a shopping trolley at a knife-wielding attacker in the city last Friday. Rogers can be seen hurtling a metal trolley towards Hassan Khalif Shire Ali twice, as police worked to apprehend the attacker before eventually shooting him. His heroic act was seized upon immediately, leading to the moniker 'Trolley Man' and praise from the public. Ali had crashed his car and set it alight before stabbing three people, killing one. Now, authorities are trying to locate him in relation to alleged breach of bail and burglary offences. "Police are seeking the whereabouts of a 46-year-old man of no fixed address in relation to a number of recent burglaries in the Melbourne CBD and St Kilda areas and breach of bail conditions," a Victoria Police spokesperson told news.com.au. While speaking to media at the weekend, Rogers admitted he had a troubled past and had just been released from prison five weeks ago for stealing a bicycle. He also spoke of his past battle with drug addiction but said he was dedicated to turning his life around. 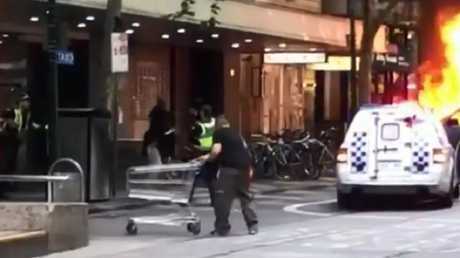 A grab of video footage shows Bourke St ‘Trolley Man’ Michael Rogers. A crowd-funding campaign, established in his name after his actions gained him notoriety, has raised more than $140,000 in less than a week. The Melbourne Homeless Collective started the fundraiser and said it would help Rogers manage the money. As he approached the knife-wielding terrorist on Friday, Rogers said he "just wanted to help and do something right for the first time in my life". Victoria Police provided no further comment on the investigation. Following the attack, Victoria Police commissioner Graham Ashton told 3AW that Rogers' actions could have had potentially dangerous consequences. 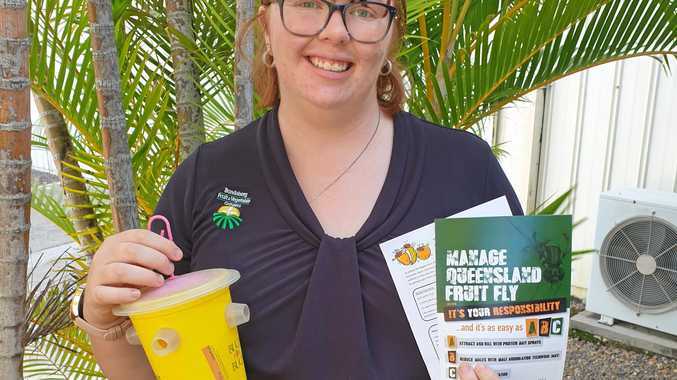 "I don't like to criticise people in that situation, he's acting instinctively about what he's looking at in front of him," Commissioner Ashton said. "But if a trolley had hit a police member and knocked him over and then this offender got on top of him, we could have had a tragic consequence. I think he was trying to support the police in his own way, so I haven't been jumping on him over the weekend."